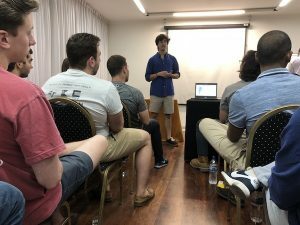 Today, the Global Leaders group had the opportunity to hear about a non-governmental organization called TECHO from its Research and Development Coordinator, Inigo Hernandez. TECHO was founded in 2001 in Chile, but now reaches all over the world, and is heavily focused in Central and South America. 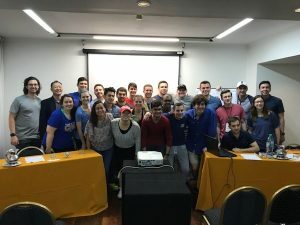 Because we met with Inigo in Buenos Aires this morning, he mentioned to us that TECHO has been involved in many of Argentina’s provinces since 2002, including Salta, Santa Fe, and Buenos Aires. 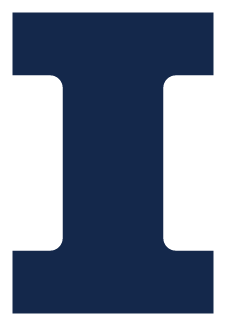 TECHO’s slogan is “Together for a poverty-free world,” and they strive to achieve this by working on projects with various communities to aid in their development. These projects can relate to a variety of topics, including but not limited to education and job training. The project that Inigo talked about with us today was TECHO’s initiative to build homes for families in impoverished areas. In Argentina, more than 11,747 houses have been built by over 118,000 volunteers. These houses are made of wood, and take 2 days to construct by the volunteers. The houses are simple, but the families they are for appreciate them greatly for a variety of reasons: the floor is elevated so the inhabitants don’t get wet when it rains; the roof provides a route for run-off for rain runoff; and the structure is sound and stable so it won’t fall over when inundated by strong winds. Inigo told us that even though these houses don’t have basic amenities like running water or electricity, at least right away, the families are still thankful for their improved privacy and sleep better at night knowing that they’re under a stable roof. The houses were all initially the same size and shape, but that changed once TECHO realized that more variety was needed to accommodate different families. Each house is now made of a varying number of modules, depending on the type. These individual modules each measure 6 m2, have a wood frame, and the walls are made of recycled plastic. Also, TECHO was initially building these houses as “emergency shelters” for the families, expecting them to not utilize the structures after a few years. But, it was soon determined that these families were aiming to stay in their communities, and TECHO strived to provide more sustainable houses so the families could improve upon them with time (adding basic utilities, for example), so that they could stay for more than a few years. After our talk with Inigo about TECHO, we headed to the international airport in Buenos Aires for the next leg of our trip: Chile! We all made it through security and immigration with no difficulties, and the plane ride was relatively short – just under two hours. 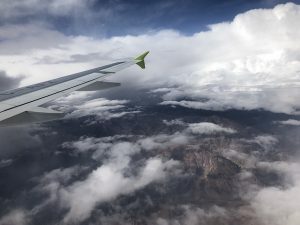 We had been told that we would be able to see the Andes mountain range outside the windows when we flew over, and many of us were able to capture a photo or two of the cool view. 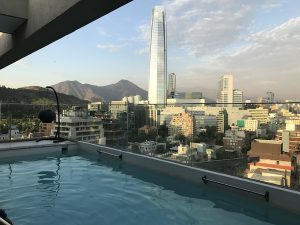 When we landed in Santiago, we were greeted by a new tour guide, Carolina, who debriefed us on some safety tips, the region where we were staying, and some customary practices on our bus ride to our hotel, the Hotel Torremayor Providencia. 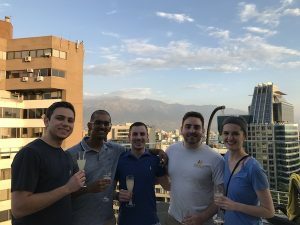 After we were all checked in, we enjoyed a complimentary “welcome drink” up on the roof by the pool, and enjoyed the incredible view that we have of the city and surrounding mountains.